I've been MIA for the past few weeks. I feel like I have been doing tons of projects, making tons of dinners, i.e. things in the food, fashion, home realm, but not posting updates. I seem to have caught an early spring fever. 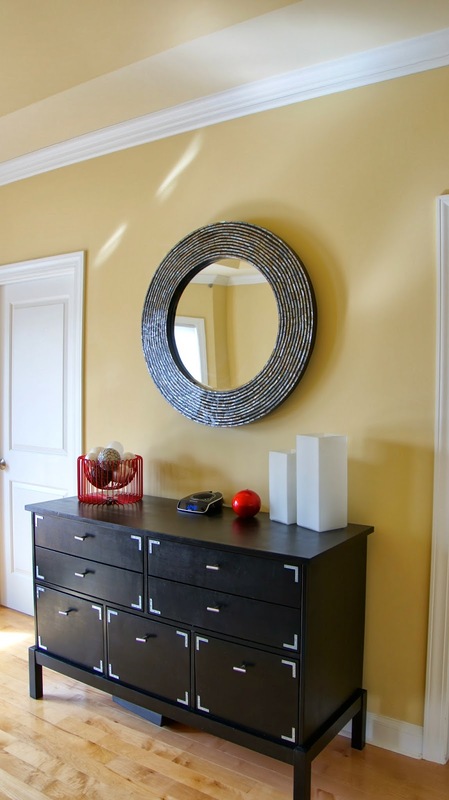 Now it's time to catch up, starting with this great looking filing cabinet makeover. Metal filing cabinets are pretty ugly. They belong in an office building, not so much in a home. There are filing cabinets that are made for the home like this or this, but they cost a good amount of money. Instead, I figured out a way to take one of those old school metal cabinets and warm it up for you own home office storage needs. 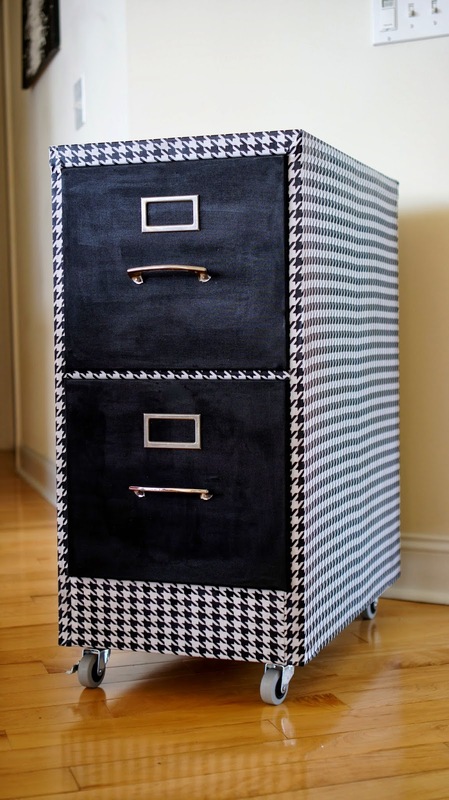 With a few yards of fabric and some glue, you can make this filing cabinet your own with a few steps and some time. Clean the cabinet with an alcohol / water mixture; make sure it is completely dry. Iron the fabric. The wrinkles will not go away when gluing. Measure and trim the fabric from the top all the way over both sides in one solid piece. Make sure there is an overhang of about a ½ inch to the front, sides, back and bottom. Start at one of the top corners and spread a thin layer of Mod Podge using a foam brush. If your fabric has lines line mine did, you will want to line up the fabric to make sure the over hang and fabric is straight. Continue spreading the Mod Podge on the top and rubbing the fabric so it is straight and flat. Make sure the fabric sticks so that there aren't any air bubbles. In sections, spread a layer of glue and then press the fabric. Do this all the way around the top and sides. Depending on your cabinet, you will need to trim the fabric to fit around the corners in the front. I used a technique similar to folding a present for the corners. Spread a layer of Mod Podge as a topcoat on the fabric to finish the project. Spread the glue evenly. You don’t want any glue stripes on the top layer of the fabric. Stay away from super dark fabric. The black fabric looks great in the photo, but I was not a big fan of how it turned out in person. There were some flaws in the metal of the cabinet, which show through on the flat black. Mod Podge comes in a variety of finishes. I used the glossy finish. Instead of using fabric you can also use wrapping paper. Use thinner fabric that isn't stretchy. Add wheels if your cabinet allows. Casters were added that we bought at our local hardware store and screwed on with nuts and washers. They usually run for about $4- $5 each, but worth it if you plan on moving the heavy cabinet around. 3 yards of fabric cost a total amount of approximately $15 on sale, purchased at Hobby Lobby. 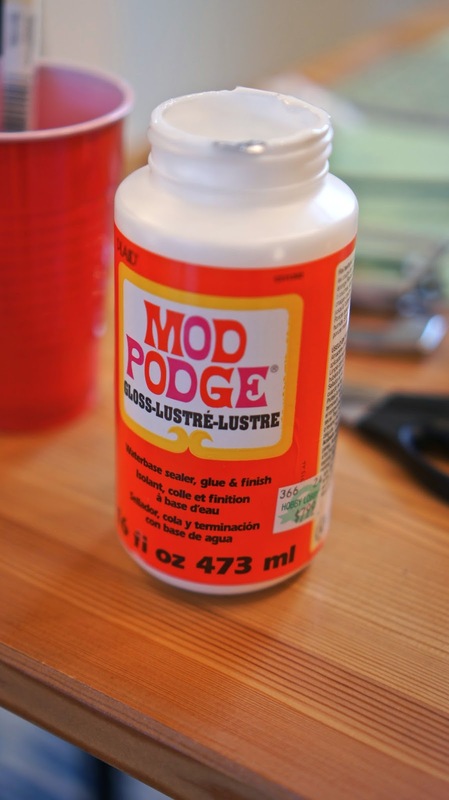 Large bottle of Mod Podge - $7.99; only about half of it was used. 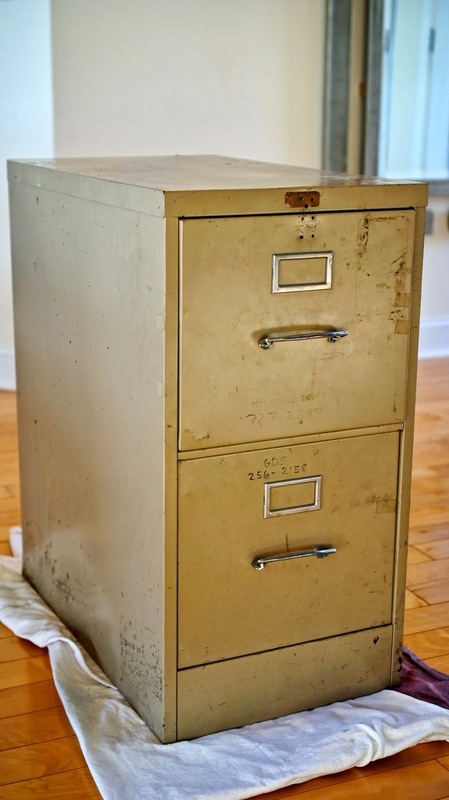 Filing cabinet was bought used from the Restore Store for $25 with 25% off which came to grand total of $19.50. Overall, I’m loving this project! It took a few short hours to complete and the filing cabinet has been completely transformed for under $40. You can literally choose any pattern, bold or neutral and make it one of a kind. I have wanted a new dining room table for a while now. 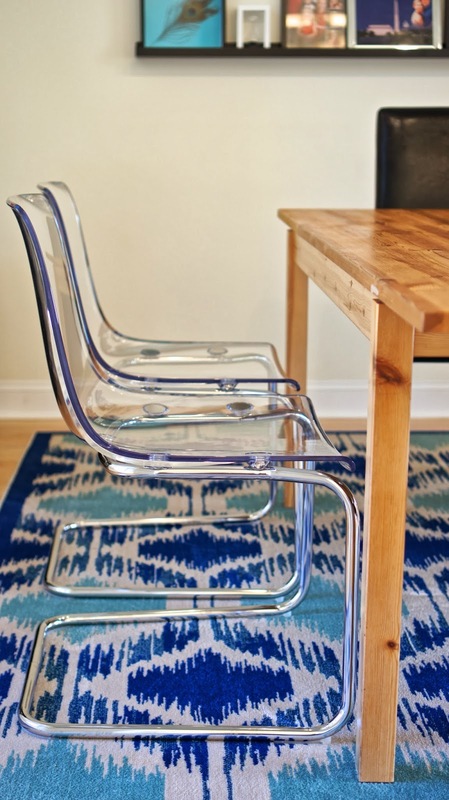 Perhaps a table like this one from West Elm or this one from Crate and Barrel. To be honest, the table we have actually works and it is similar to the ones I'm craving, but it isn’t as beefy as we prefer. Instead of getting a new dining room set, we decided that it would be best to get new chairs to replace the benches we have that run the length of the table. We've had them for eight years and those benches needed to go. They are now sitting pretty along the walls in the ground floor main room. 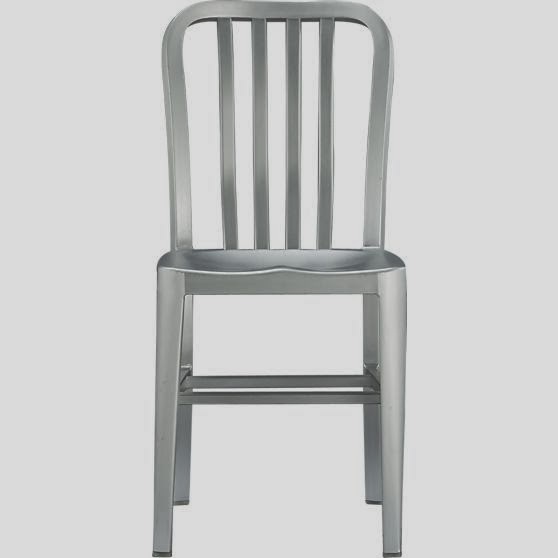 When looking for new chairs to replace the benches, we wanted something that was completely opposite of the black leather chairs. These chairs are already at each end of the table that are going to stay, so we were looking for something that was of a different material. Here are some of the options we were considering. 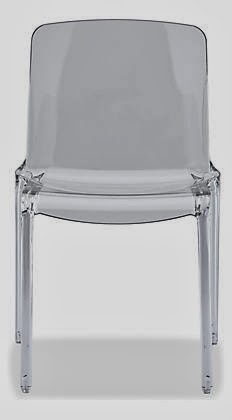 We went with the lucite chairs from IKEA. 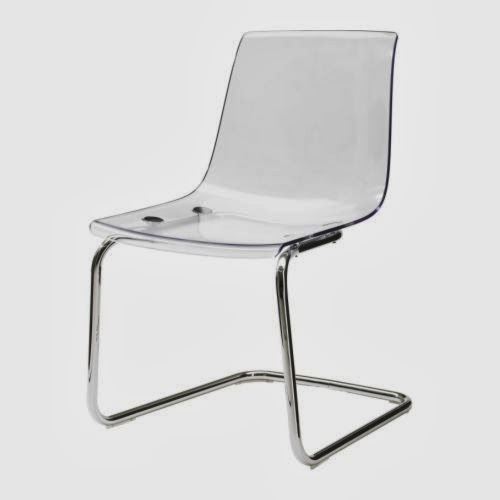 The metal chair from Crate and Barrel was my second choice, but after going on a quick stop to IKEA one weekend, we decided that the lucite was the look we were aiming for. 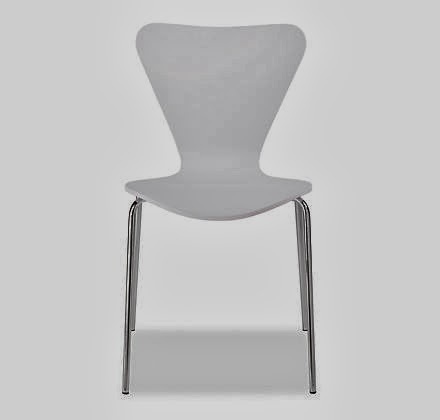 They were modern, but comfortable and fairly inexpensive at $79 each instead of $199 from Room and Board. Putting them together took a few minutes each. Don't you just love putting together furniture together? Me neither, but seriously it took about 5 minutes per chair. Easy, peasy! This project has been in the back of my mind since I pinned it over a year and a half ago. I wanted to do it, but never quite got it started until the day I went to Hobby Lobby and all the canvas was 50% off. That was motivation enough. Frugality is the mother of invention too. 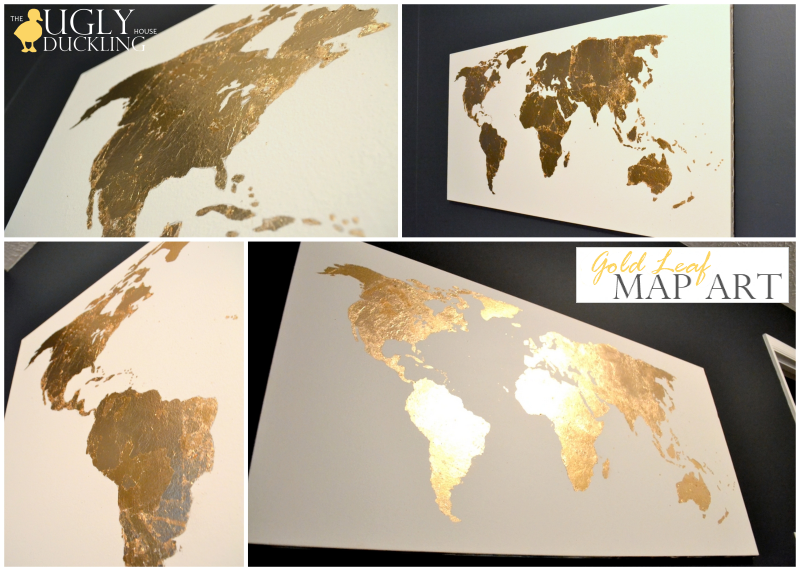 Gold really isn't in the color palette in our home so I choose to use silver leaf instead. This truly was not super difficult, but it was really time consuming and tedious at times. The steps are minimal, but plan for a few days because after a while you will want a break. 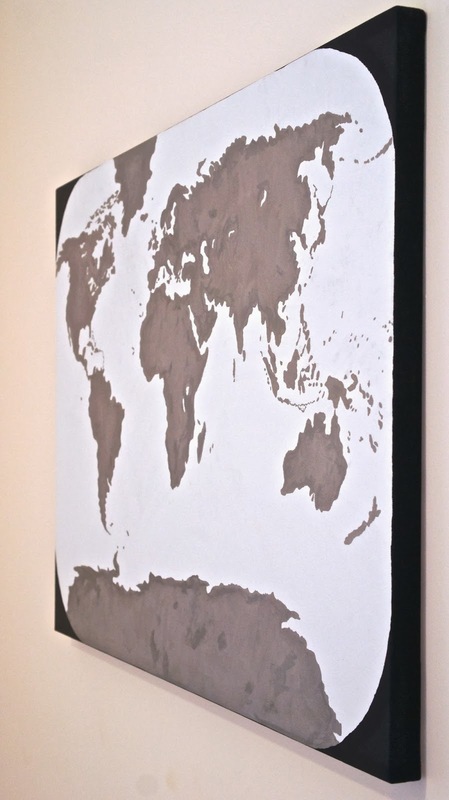 Trace an outline map of the world onto the canvas. I am lucky enough to be a teacher with access to a projector. I simply searched an outline map of the world on the iPad and traced lightly with a lead pencil. Now, you might have a tv projector at home or even a teacher friend that can help out, but if not, fear not, you can always make your own projector at home. Some people are so innovative. You'll see that there are many variations in perspective on the world maps, some with Greenland lower, or higher and some leaving out Antarctica altogether. Choose your favorite. I choose to use liquid silver leaf and paintbrushes. Outline the coastlines and the islands first, then fill them in with a larger brush. You can see the strokes and even what order it was painted, but I think that adds character. This process took two nights of about two hours. Make sure you are in good light when doing your final touch ups. The silver leaf can play tricks on your eyes. When bringing the canvas outside to be sprayed, I noticed many areas that had missing silver leaf. Leafing with actual silver leaf involves many intricate steps, especially with the world not being perfectly straight. If you are up for trying, you need to buy the special adhesive and the leafing. The good thing is that the leafing will only stick to the adhesive, but you would have to be very precise with where the adhesive was sprayed. After all the painting is done, go around with your handy eraser and make sure you don’t have any pencil lines or smudges on the bare part of the canvas. With a small roller, I painted the sides of the canvas to create a frame effect. I also added some curvature to the earth by edging onto the front of the canvas. It made it look a bit old school, which I liked. To make sure the curves were equal, I measured in eight inches from each side corner and used a circular Tupperware top to create the arc. This way, they were all symmetrical. I actually free handed the curves with the paint. This was a recommended step on the bottle of silver leaf that I purchased. This acrylic clear coating was a matte finish. I didn't want a glossy finish to take away from the silver leaf finish. Let it dry for a few hours before mounting on the wall. Overall, I am pleased with the way this project turned out. I do wish I hadn’t chosen a map with the perspective with Antarctica so large. It somewhat looks like we are looking at the world from an angle below. If I was to do this again, I might have totally left Antarctica out in the cold (get it? ).